Let’s talk about stuff…For a week I stared at the suitcases I brought down from the attic. I procrastinated and procrastinated until I ran out of time. Finally, had to do it. I had to pack. You’d think this would be easy for me. I mean, I used to be a travel writer and I had this packing thing down to a science: I’d take the same few outfits and my bathroom bag was always ready to go. 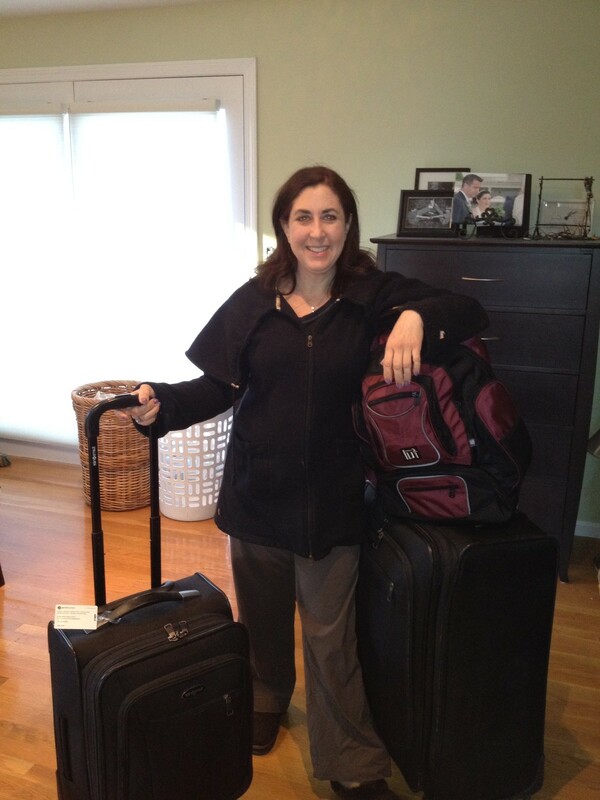 But, this time was different…..whatever I packed would be my “stuff” for about the next three months. So, I looked at stuff, my stuff, a little differently. Sure, I could just toss things in a suitcase – knowing that I’m not going to the Amazon and I can always buy things that I may need or forget. Or, I could turn this into a different sort of exercise: an exercise in minimalism. I chose the latter. As I pulled things out of drawers and out of my closet, I looked at each “thing” and thought, “do I really need this?” As it turns out, I don’t really need a lot. None of us do, really. And as I packed my stuff away, I took a closer look at my messy closet. It’s not a big closet and I share it with my husband Joel. When he moved in three years ago, we considered enlarging the relatively small closet or building a new one. Instead, we took the attitude that if it gets too crammed in this here closet, we’d just make more space by giving things away. Neither of us buy much in the way of clothes and I practically live in yoga garb (digressing just a bit: I did go shopping this month as I realized I might need some more “street” clothes). Joel and I both talk about the day when we will leave this big house and take everything we need with us – in our cars. But STILL, there is a lot of STUFF in here and STUFF I don’t need. Let’s be honest: Most of us could fit everything we truly need into one small bag. As the Beatles say, “All You Need is Love” — and, may I add, a well-worn sweatshirt, iPod, and iPad. I managed to quite easily fit my clothes and some other miscellaneous items into one large suitcase weighing 46.8 pounds and one small carry-on sized suitcase. For all you chicas out there: I even decided against taking the white shoes (although they are absolutely OK after Memorial Day, according to my Jewish mother), clogs and hiking shoes. Instead, I opted to take just a few pair of bare essential shoes. I must admit that I bought a pair of $85 walking sandals at REI last week because I thought I would really “need” them. I guess the dog didn’t agree and she broke into my room last night (really, the door was closed but she can jump up and hit the door pull to open it) and stole one of these shoes right out of my suitcase! Oops, there goes part of a heel and yup, this is getting to be a trend (see the Post: Oops the Dog Ate my Tap Shoe). At 11 o’clock last night I stared at this shoe and ya know what? I deemed it “wearable” and tossed it back into the suitcase. So, here I am…… sitting here on a plane to Los Angeles with just a backpack (no purse, I might add) containing this here laptop, some snacks and water, my phone, my iPod, my GPS (can’t live without that! ), my iPad (for reading purposes), camera and a few other things. Besides not a lot of clothes and a well-heeled sandal, a few other non-negotiables in my suitcases are: my pillow, eye pillow, yoga mat, and flat-iron (OK, I know, it’s frivolous but a girl’s got to have at least one G-rated guilty pleasure that she can’t leave behind). There you have it….I didn’t bring much stuff. And you know what? I already feel lighter! Why? Well, you guessed it and here goes – a bit of yoga philosophy for you from 30,000 miles high…. Most of you reading this live in a Westernized country where we have all of our basic needs plus some. We don’t think twice about pulling into our garages or driveways in our cars and turning on lights. We don’t think about how lucky we are to live in a home with furniture and how it easy it is to just swing open the fridge to grab a bite to eat. And in fact, we tend to go through life accumulating things and sometimes we even like accumulating stuff more than we like the stuff we have. Huh? Paring down stuff is cleansing. Word. With that, I am going to try a little experiment. I plan to be home for a “visit” in May and you know what I’m gonna do? Before I get home, I will think about all the things in my closet I miss. I’m thinking it will be a short list but you never know. Then, I plan to get rid of 80% of my already slim pickings of a closet. Because if it’s not in my two suitcases already, it didn’t make my “stuff” short–list and I likely don’t need it. Plus, I have enough baggage already. from susan and jerry, we wish you and Noah the best of luck. We love all of your updates, keep them coming. tee hee and you can live mostly in yoga gear around here so you are all set! See you soon….I flew in yesterday. Love reading these.Looking forward to seeing you and Noah. Universal looked like fun. couldn’t agree with you more! We spent 10 years living a fabulous life in small houses (1200 sq feet or less). We had very little stuff. Now, we own a slightly bigger home and we purchase. I need to cleanse!